At sea level, where most people grew up, cannabis stays moist long after it’s harvested; that’s why most of us remember sticky pot from our youths. So, at sea level, if you got some bone-dry pot, there was a good chance it’d been sitting around for a while, and that’s why most people equate dry pot with old pot (which is bad pot). However, Colorado is just about the antithesis of “sea level,” and thanks to our altitude, pot dries out quickly. It’s an elevation thing, not a quality or age thing, but it’s difficult to change opinions once they’ve formed—that’s why this week, I wanted to talk about Colorado’s dryer-than-everywhere-else marijuana to set the record straight. So, let me reiterate: the only thing wrong with dry marijuana is that it might be old if you find it somewhere that’s close to sea level like California, but if you find dry marijuana in Colorado, it’s because you’re more than a mile above the sea, and here, plants dry out quickly. That’s just the way it is. But here’s the important part: dry pot is actually a good thing because it weighs less, so you get more. If you were to buy an eighth (3.5 grams) of dry marijuana and set it next to an eighth of moist marijuana that weighed the same, the dry eighth would look much larger thanks to less water weight (as an aside, I apologize for already using the word “moist” twice in this blog, but it’s a necessary evil). Do you see what I’m getting at? If you can get over that old-school paradigm of “dry pot = old pot,” you’ll realize that you’re actually getting more for your buck when you buy dry pot because you get more marijuana and less water. Ask yourself this: do you want to smoke water, or do you want to smoke cannabis? Exactly. Alright… after reading that, I’m sure you thought something like, “well yeah, but how do I know if the dry marijuana I buy in your Durango dispensary isn’t just old pot you’re trying to blame on Colorado’s elevation?” Well, good question, but I’ve got an answer for you: we wouldn’t do that. Ever. We both purchase and grow our cannabis in small batches to ensure freshness, and we keep our flower sealed tightly before we bring it onto the floor. But there’s a second reason I wanted to write this blog, and it deals with one of the most common questions I get: “how do you rehydrate dry pot?” (this is important to a few smokers because hydrated pot burns a bit more slowly). Well, the way most people do this is by sealing a fresh piece of bread in with their flower. The moisture from the bread will rehydrate the flower and make it sticky just like you remember. That being said, please don’t do this. For one, your pot will taste a bit like bread, and two, if there’s even the slightest amount of mold on your bread, it can spread to your weed, and smoking mold isn’t good for you. So, instead, try a two-way humidity control pack. 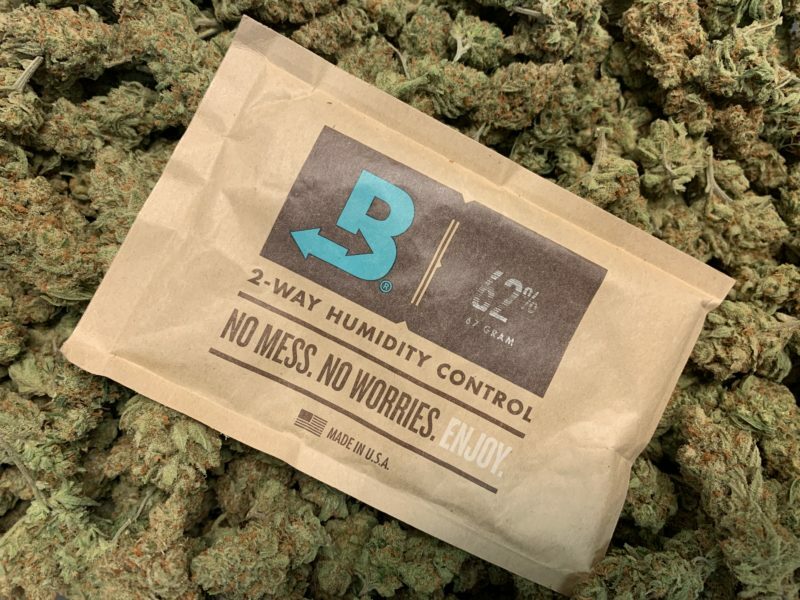 In our Durango dispensary, we use Boveda packs, which you can read about by clicking THIS link. I’d recommend using the 62% version, but basically, a “two-way” pack works in two ways (duh). If your pot gets too dry, these packs will add moisture, but if the moisture gets too high, these packs will take it back out for that perfect balance. So, if you seal a 62% Boveda pack in with your flower, you’ll keep all your flower at the perfect moistness (is that four times using the word?) for as long as the pack keeps working, which is a long time. That way, if you buy a dry eighth which is good because you get more pot, you can take it home, rehydrate it with your Boveda pack (which won’t make it mold or taste like bread), and you’ll get the best of both worlds: you’ll get more flower weight because you bought it dry, but the Boveda will make your flower sticky just like you remember from your sea-level childhood. But as always, if you have questions, it’s always best to give us a call at (970) 403-3710 or come see us (with your valid I.D. proving that you’re 21or over) at 208 Parker Avenue right here in Bodo park. We’ll tell you everything you need to know about rehydrating your marijuana if you want it to be sticky and burn slow like you remember. And we’ll prove to you that our marijuana is fresh (and the best in town), because We’re Your Best Buds!